This evening reception is going to be everything. Both Meghan Markle and Prince Harry went with outfit swaps between the first reception at St. George’s Hall in Windsor Castle and their second celebration of the evening at the Frogmore House on Saturday, May 19. 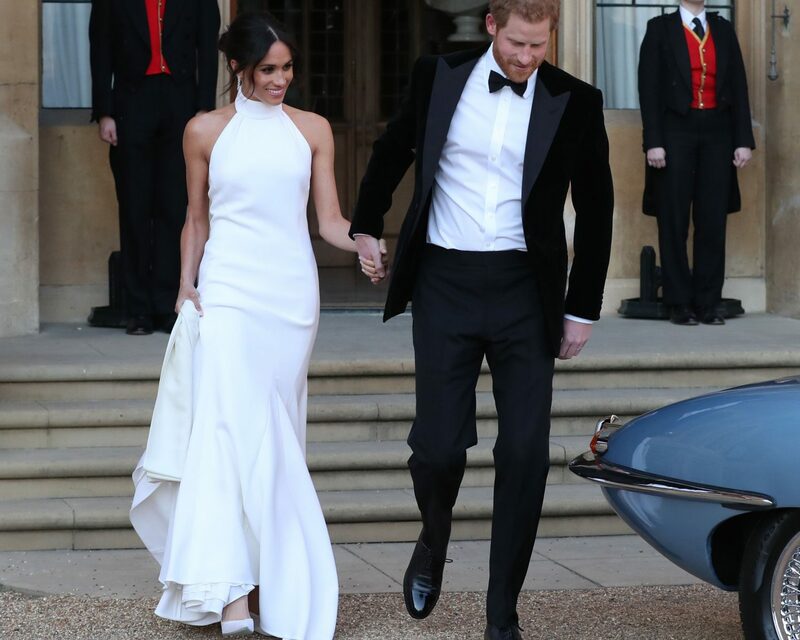 The bride, now known as Her Royal Highness the Duchess of Sussex, stepped out in a beautifully polished and structured sleeveless gown featuring a high neck accentuating her toned arms. The piece itself was designed by British designer Stella McCartney. Prince Harry looked equally dapper in his formalwear, wearing a fitted tuxedo with a sleek black bowtie. His outfit swap was also a departure from his previous frock coat uniform tailored by Dege & Skinner on Savile Row. The couple adorably grinned and held hands as they left Windsor Castle in an open-top classic sports car from 1968 that now runs on electric power. For the actual wedding ceremony itself, Markle looked resplendent in a figure flattering-yet-simplistic, sleeved, bateau neckline gown by Givenchy designer, Clare Waight Keller. (Waight Keller, who’s British, is a force of her own as the first female Artistic Director of the French fashion house). Be the first to comment on "Meghan Markle Steps Out in Her Second Wedding Dress: See the High-Neck, Sleeveless Look Here"